You know how after some yoga classes you feel more balanced and centered and after others you feel more disjointed and discombobulated? There are many factors that affect the outcome of a yoga practice, but one of the most important ones is the idea of pratikriya, or counteracting. In the course of the practice we always challenge the body (by taking the spine and joints through a wide range of motions), the breath (by deepening it, controlling it and working with it in other ways) and the mind (by focusing the attention, overcoming resistance and so on). The challenge is great, but we also need to take steps to return the body, breath and mind to the state of balance. This is where the idea of compensation comes in. When it comes to the asana part of the practice, compensation might seem straightforward – if you bend one way to do a difficult posture, afterwards bend another way and you’ll be done. This makes sense, but it is a bit more complex then that (isn’t it always? ☺). Here are some suggestions on how to do compensation throughout the practice. 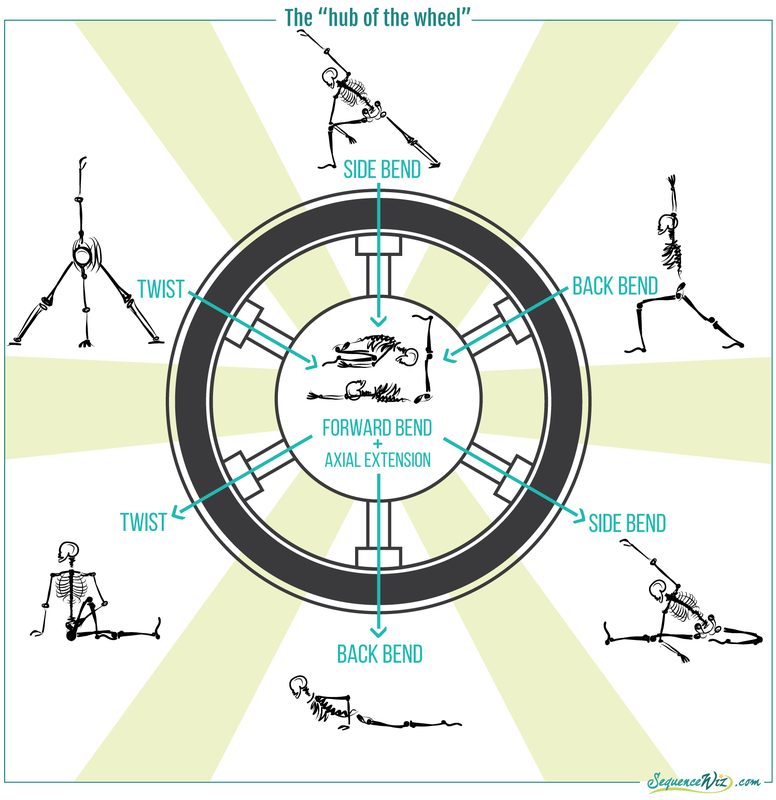 In the viniyoga tradition we call forward bends “the hub of the wheel” with back bends, lateral bends and twists forming the spokes of the wheel. This means that forward bends serve as universal neutralizers for all other directional movements of the spine. Extension poses play the same role, helping the spine return to the neutral position. So if we want to have a balanced practice, we would include multiple forward bends and axial extension postures throughout to help balance out other more challenging spinal movements. 2. Move from deep to not so deep. 3. Move from complex to simple. In a similar way, if you gave detailed instructions and spend a lot of time and effort getting students into a particular complex posture, the pose that comes next should be much more simple to give their bodies and minds a break. 4. Compensate specific areas of accumulated stress. In private yoga sessions – What is more important to an individual student, knowing their history and challenges? In a class format – What would most students benefit from? In your own practice – Which area feels the most vulnerable today? So in reality, a lot of thinking goes into deciding how to compensate for specific poses throughout the practice and bring the body to the state of balance, but the rewards are obvious as well. Proper compensation minimizes the risk of injury, helps develop the body in a more balanced way, insures gradual, steady progress and helps students feel more balanced and stable at the end of the practice. Thank you so much, Olga, for this very informative and enlightening post. My YTT teacher recommended doing at least one “neutralizing” posture (as she called it) right before Savasana. A perfect example is Apanasana, with the belly relaxed and inactive legs. I realize now that this is actually is a compensation pose that releases accumulated tension in the spine, most muscles, and diaphragm. I’m so grateful for you and your wonderful and very meaningful site. Namaste. Thank you Janis. Exactly! Apanasana is a great neutralizer; one can use it safely at different points of the practice. Thank you so much for this article! Many current 200-hour teacher trainings do not address the intricacies of sequencing, and the importance of appropriate counter poses. I hope this is shared far and wide! I’m replying late, but I’ve only just read this………… This boggles my mind. I don’t understand how any teacher training doesn’t cover the importance of intelligent sequencing. Just goes to show that not all teacher training programs are created equal and it’s vital that the trainee research to find the best program. But often trainees have no idea what to look for. As a teacher who is often asked about TT recommendations, I encourage potential students to put as much effort into researching programs as they would into the training itself. Next story How do you know what a yoga pose is meant to accomplish?